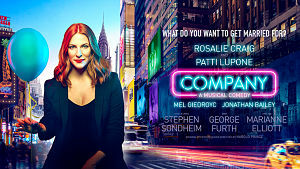 Marianne Elliott directing Stephen Sondheim and George Furth's musical comedy COMPANY, about life, love and marriage. Liam Steel is in charge of choreography and movement direction. Patti LuPone is starring as Joanne opposite Rosalie Craig as Bobbi at the Gielgud Theatre for a limited run only booking until 22nd December 2018. Former Great British Bake Off host Mel Giedroyc is playing Sarah, who is married to Harry played by Gavin Spokes . More cast members include boyfriends: Andy, PJ, and Theo played respectively, by Richard Fleeshman (Guys And Dolls, Ghost The Musical, Call The Midwife and Sting's The Last Ship); George Blagden (Louis XIV in Versailles) and Matthew Seadon-Young (Billy Elliot and Beautiful). (In previous productions the male Bobby had a trio of girlfriends: April, Marta and Kathy). Broadchurch star Jonathan Bailey will play Jamie (original character called Amy) and Alex Gaumond takes the role of Jamie’s partner, Paul. Daisy Maywood will play Susan. Richard Henders plays David who in past productions was in business. Now he's a house-husband while his wife Jenny played by Jennifer Saayeng (previously a stay-at-home spouse), has now become the breadwinner . Elliott & Harper Productions are presenting this iconic musical with the lead role of “Bobby” re-imagined for the first time as a woman. At Bobbi’s 35th birthday party all her friends are wondering why isn’t she married? Why can’t she find the right man? Why doesn’t she settle down and have a family? One thing is for certain; you will fall in love with Company. Featuring Stephen Sondheim’s iconic songs – The Ladies Who Lunch, Being Alive and Side by Side.The 1970 musical has received some modern updates. Chris Harper, a business partner to the director says, "Bobbi is a sexually confident woman, looking for love. She's a woman of today, really 2018." LuPone said she is doing the show because of Marianne Elliot saying "She's a visionary."